Jack said that he got Steve's message... But that it was once again a mistake from his older... 'wiser'... brother...!! Just as the announce team began to speculate on what Ricky was saying, Steve DeColt arrived!! 'The Outsider' then told Ricky that his 'beef' is not with him... He suggested Ricky leave the ring... because he was coming for Jack!! Steve ran to the ring, and as he got there, Ricky climbed out... Jack saw his brother desert him, and calmly did the same before Steve could get his hands on him!! Jack pointed to his head, and put his arm around Ricky... Claiming it was their plan all along, and that Ricky is a genius!! An excellent couple of weeks for James Hernandez, as the Television Champion made another successful defence of his Title. Derek Frost, much like his tag team partner Dan DaLay, gave a good showing of himself here. He overpowered and tried to bully Hernandez, but the man known as 'Mainstream' exploded into life late on. Eventually hitting 'Apparition #14'! James Hernandez will learn his opponent or opponents for Super Slam a little later tonight... But he's also IN the Super Slam Battle Royale!! Backstage, Katie Cameron had (her current real life boyfriend) Thrill Seeker and (her current real life EX boyfriend) Jacob Jett with her! He suggested that Edd and Duane Stone confirm their inclusion too... Maybe World's Most Wanted will see them there...!! The Mavericks again came into this one with a point to prove. Last week, Jared Johnson called his former tag team partner Julian Watson, “John Maverick's B***h”, and Watson was not impressed by this. Late on, Maverick and Watson took Johnny Bloodstone out by slamming him hard into the ring steps. Maverick then locked Johnson in his 'Deadly Silence' while Watson shouted: “Who's Maverick's B***h now?!”. He also beat Dan and Jeremy, with Duane on his side, on Day Two of the same event!! 'The Man Without Fear' Sonny Wildside made his way to the ring next... for the much anticipated contest against Ernest Youngman! This was an incredible outing for both of these young talents. Sonny Wildside is just 22 years old, while Ernest Youngman is only 24 himself. It was back and forth throughout, but Youngman made a big error late on. He attempted a German Suplex from the top rope, which would have won him the match. But Wildside fought him off and he landed with a thud in the middle of the ring. With Youngman laying prone, Wildside was looking to hit his 'Fear Factor' (Moonsault Stomp). But the match ended when someone shoved Wildside off the top rope! Dean Waldorf and Marv Statler held Sonny Wildside for Youngman, and then threw him off the ropes for him to plant Wildside with 'The Hit' (Pounce)!! Harrison Hash is one of those wrestlers who truly live up to their nickname every time they go to the ring. He was 'All Business' tonight, and was fully focused on scoring the win over 'Lord' James King. King is a posh snob, who acts disgusted at every act of violence against him in the ring. However, he can dish out the violence with the best of them. In the end though, Hash delivered his 'Century Suplex', and there was no life left in James King. The match is beginning to fill up with big names and current and former Champions now!! Aldous Blackfriar and Mutant were FURIOUS and Donte Dunn's comments, and said they look forward to eliminating Dunn and Strong next Sunday!! As for next week, Dunn will go 1 on 1 with Aldous...!! This match started at a frantic pace, with Akima Brave hitting a brutal looking Samoan Drop! The pace didn't slow down for a long time either, with both men hitting kicks and strikes a plenty! For the finish, Trent Shaffer came off the top rope and hit a frog splash. He then grabbed Brave's arms, and then slammed down with a stomp to the chest he calls: 'Heart Burn'! The Main Event tonight was a jam-packed, star-studded affair... a Six Man Tag, featuring two of NOTBPW's hottest rivalries!! Another hard-hitting affair, that began at the most frantic of paces. All six men were in the ring, and the rivalries between the two teams boiled over into a huge fight! It resembled the Battle Royale we're going to see in a couple of weeks, with bodies flying everywhere. The referee finally calmed things down, and we returned to a normal six-man tag team match. From then on, Tim Westybrook, Cameron Vessey and Christian Price looked a dominant force, and they isolated Mighty Cavanagh. For the finish, the Natural was brutally taken out by a super kick from Price, and he landed back first on the ring steps in a nasty bump. Owen Love was then isolated in the ring, and as Vessey and Price held Mighty Cavanagh, he was made to watch as Westybrook hit 'TNT Whirlwind' and pinned Love! Then, Tim Westybrook and Mighty Cavanagh will be in a Triple Threat Match for the Television Title, along with Champion James Hernandez!! Westybrook, Cavanagh and Hernandez will be pulling double-duty that night, as all three will enter the Battle Royale!! 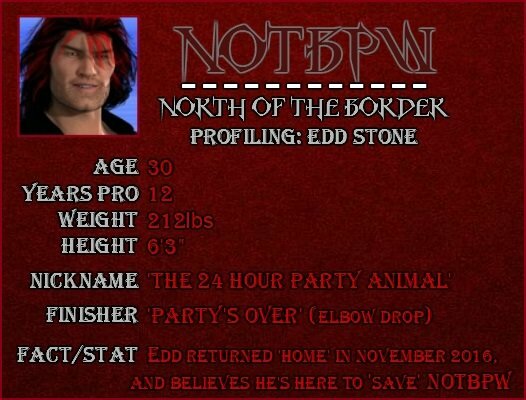 I made a bit of an error here... A year ago, I signed a bunch of talented youngsters to fill out my developmental fed. For some reason, I always sign a one year contract for 'Developmental Deals'. So now, a LOT of guys contracts are coming up. And since I've built up guys like Ernest Youngman, Aldous Blackfriar, Mutant, The Ring Generals, and others, they're attracting the attention of SWF, USPW, and TCW!! 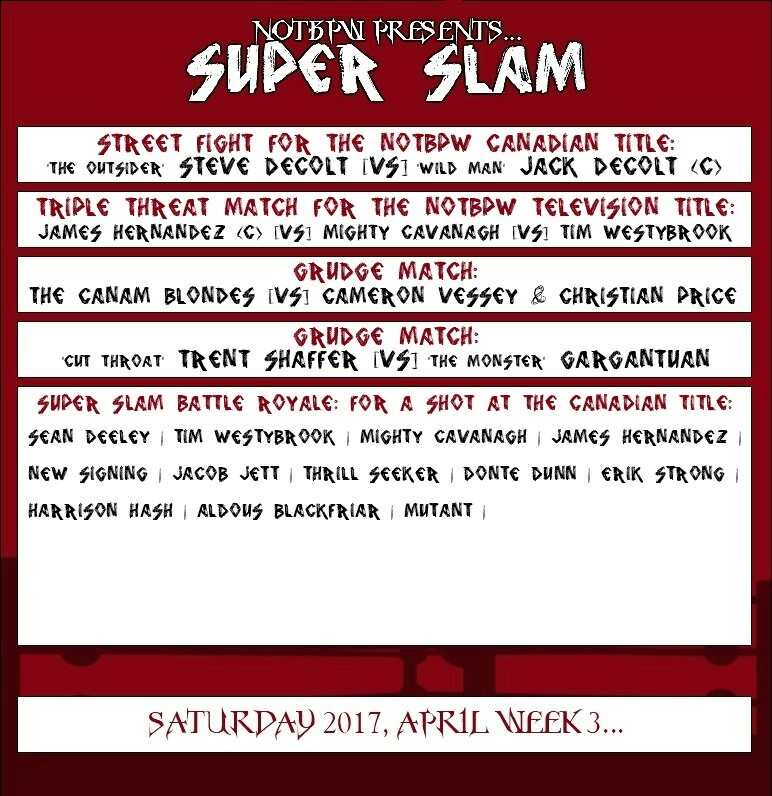 I'm also trying to make one more signing for the Super Slam Battle Royale, but it isn't happening at the moment... I've lost Jared Johnson and Johnny Bloodstone... I missed out on Wolf Hawkins... and now my roster could be RIPPED apart!! Balls! !